Thomas is due a guaranteed base salary of $8.5 million on February 10th, which the Broncos will almost unquestionably pay. Cutting Thomas this offseason would result in a dead cap number of $15.1 million, and would also be a significant hit to locker room morale. Thomas has been one of the most consistently productive receivers in the NFL since 2012, despite an issue at times with dropped passes or even fumbles. He was paid like an elite NFL receiver, and through some serious quarterbacking issues over the last two years, I’d say he’s done pretty well overall. 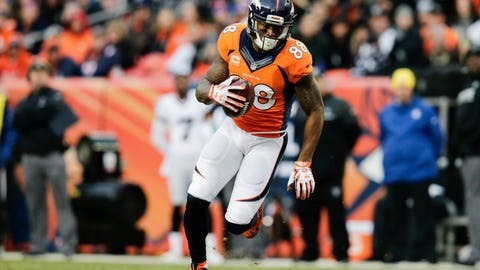 With the departure of his good friend and teammate Eric Decker in 2014, the Broncos have tried to ease the pressure off of Thomas with the addition of Emmanuel Sanders that same offseason. Sanders came in and has been fantastic as the ‘Robin’ to Thomas’ ‘Batman’. In addition to his base salary being guaranteed here soon, the Broncos also have an option bonus of $4 million to exercise starting on the 10th, and it remains uncertain how they will approach that. They have until the end of the 2017 league year to exercise it, but I don’t see why they wouldn’t. After this season, the dead money hit on Thomas goes way down. Perhaps the Broncos will take a close look at his production this season, how his body is holding up as he approaches his age 30 season (2018) and go from there.